Broken Chains started out of the heart of a recovering homeless man and his compassionate wife. If you haven’t read the story of our founders, we encourage you to read it now. What started out as simply feeding the homeless a Christmas meal out of the trunk of a car, has turned into a weekly ministry with large outreach opportunities throughout the year. Broken Chains has the philosophy of meeting the homeless where they are. We don’t hold meetings in a facility compared to a rescue mission or the Salvation Army. Instead, we do most of our weekly ministry in the park. We cook our meals for the homeless over the community BBQ’s, and hand out clothes on cement park benches. Additionally, Broken Chains partners with other organizations and businesses to help bring greater success for reaching those in need in our community and helping the homeless. We encourage you to see the list of some of our current community sponsors. 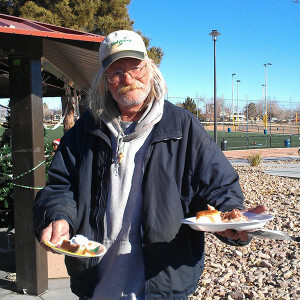 We have a mantra at Broken Chains Ministry that comes out of our core values, and why we focus on helping the homeless. That mantra is that we do not exist to give the homeless a handout, we exist to give them a hand-up. We exist so that we can help those in need get on their feet and out of the ditches of life. The homeless have many needs in every community. We have focused on a core few. We have found that these help to not only take care of physical needs including food, but also spiritual needs with Bible studies, a warm community environment, and discipleship. Everyone working with our ministry does so voluntarily. Our volunteers range in age from 5 to 85 and come from all walks of life. From different community associations and churches, to local business women and men desiring to give back to their community. Others volunteer throughout the week to help us receive and manage donations made to Broken Chains Ministry by individuals, organizations, schools, and businesses. We also have a great team of volunteers that distribute these resources to the homeless, but are always looking for more helpful hands. Our Wednesday night outreach has seen people come from all around the world to experience the incredible learning and time of giving that we share with the community. The weekly meeting is not boring to say the least. It is always a special experience each time for everyone who attends, and makes it a priority in their lives. From ministry groups visiting from Africa, to bike riding associations, everyone is invited and we welcome all interested in learning, sharing, and being a part of any of our outreach events. We don’t care what denomination, or association your church may be a part of. We welcome anyone who wants to share in and hear the message of good news through salvation and trusting in Jesus Christ. Whether you are a back-row Baptist, evangelical small group team, an LDS youth group, or traveling from another country to Vegas, come one come all. We invite and welcome all to share in the joy of helping others and hearing the good news of Jesus that we share every Wednesday night! Visit our Be A Part page to find out more how you can be a part of our ministry. One of the biggest success stories we have had in our community is partnering up with local schools for a program called Two Lunch Tuesdays which provides sack lunches for the homeless. Find out more about Two Lunch Tuesdays. Find out more about our Celebration of Life Services and those whom we have been blessed to celebrate them for.